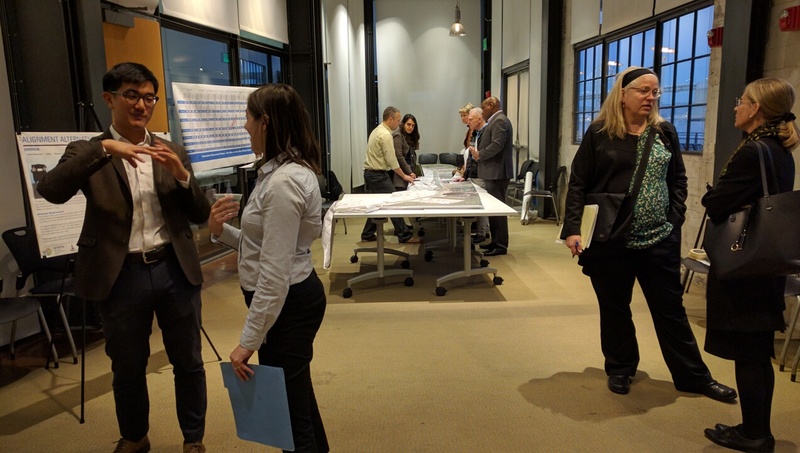 The SFMTA, Port of San Francisco, San Francisco Planning Department and San Francisco Public Works Department are collaborating on a planning project that will increase safety and comfort of travel along The Embarcadero. 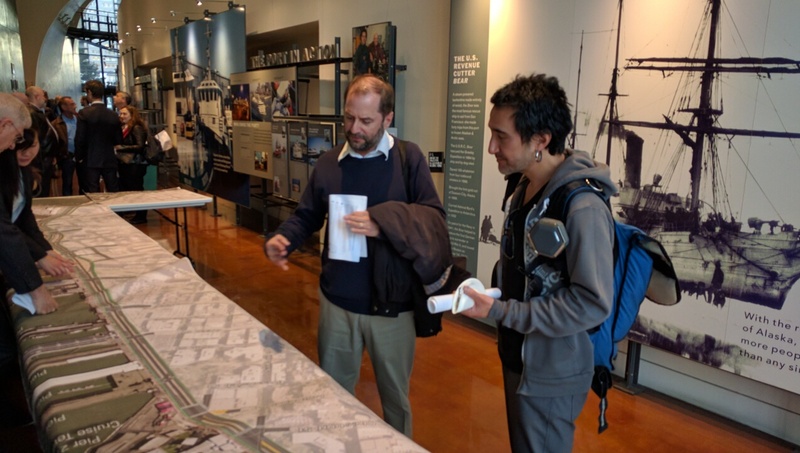 Working with the community, the Embarcadero Enhancement Project seeks to develop a Complete Streets conceptual design and cost estimate that includes a bikeway along The Embarcadero from AT&T Park at King Street to the Fisherman’s Wharf area. A bikeway is a bicycle facility that is physically separated from moving or parked vehicles and pedestrians. The meeting was split into two spaces to showcase and discuss two alternatives for the street. 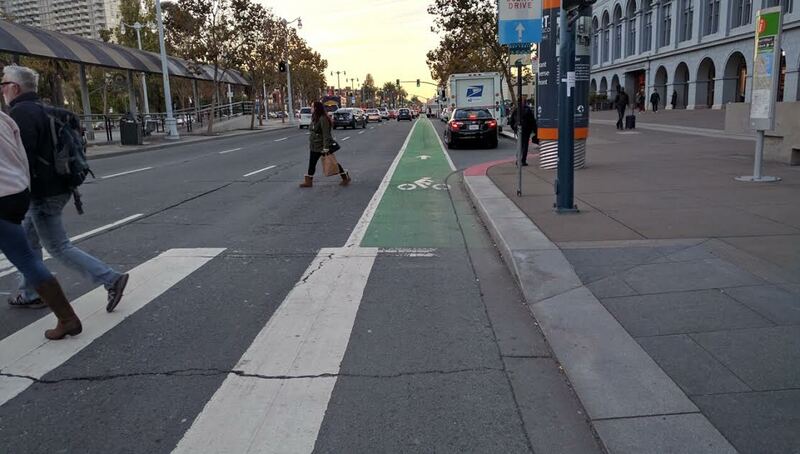 In one room, seen in the first photo after the break, was a “complete streets” plan that would put a curbside, protected bike lane on both sides of the Embarcadero. The other plan is exploring a bi-directional lane on the seaside promenade. Michael Anderson, in the photo below, wants to see cars given the lowest priority on Embarcadero. “There are trade-offs,” he said. “The lowest trade-off is the private automobile.” He also said he wants to see narrower lanes, since the SFMTA minimum lane width, in his opinion, encourages motorists to speed. 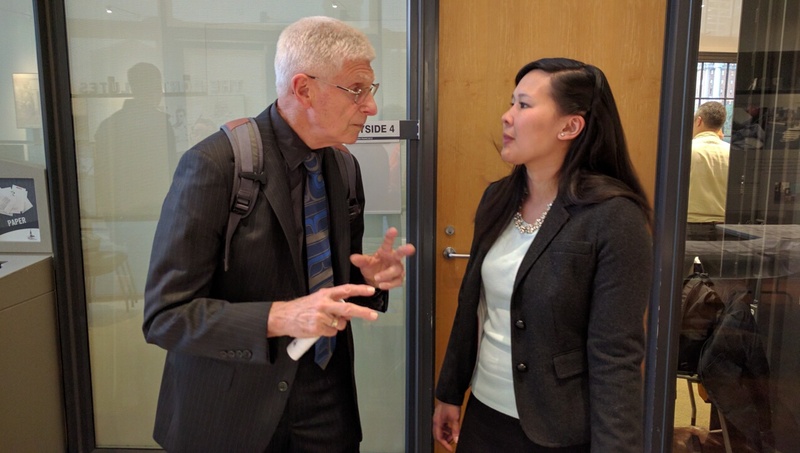 Kimberly Leung, on the right, is with SFMTA’s sustainable street division. 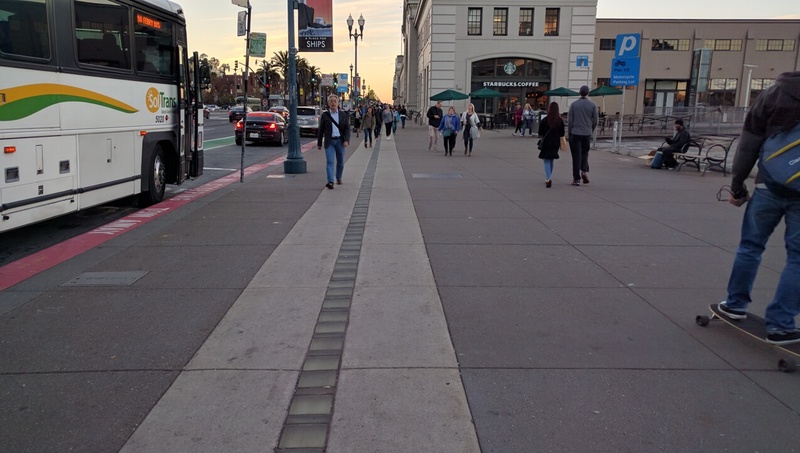 She said 10.5-foot lanes are the preferred minimum width, but they could potentially go narrower on the Embarcadero. Meanwhile, in the other room, another set of SFMTA officials discussed the possibility of a two-way bike lane on the promenade itself. “The main purpose of this meeting is to find out which alignment” is preferred, explained Gabriel Ho, a project manager for SFMTA. 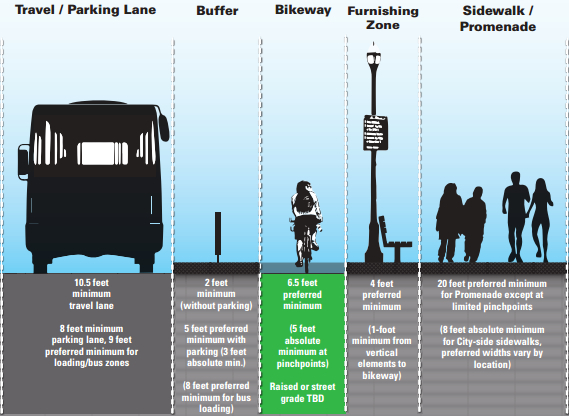 Streetsblog wondered why it was so important to pick one or the other–why not do both? A two-way, seaside bike lane would be great for tourists who want to putter along and admire the Oakland Bay Bridge and the ocean, but commuters might prefer an on-street, protected bike lane so they can just get where they’re going. Currently, there’s already a pedicab route marked on the promenade (although it’s not well delineated) in addition to the existing bike lanes on the street, so the precedent of having both a tourist bike facility and a commuter bike lane is already there. “We’d have to see if the preference is there, but it’s possible to have both,” said Ho. He also iterated that this is part of a “complete streets” project, so bike lanes are not the only thing they’re looking at. For example, they might try stop consolidation on the F-Market light rail, to make it a faster, more usable service. They’re studying lane reductions and street-parking elimination as well. Meanwhile, just a couple of years ago SFMTA boasted about upgrading the Embarcadero’s bike lanes to “green status,” which was supposed to mean “next-generation bikeways that offer a convenient, comfortable and safe place for people from ages 8 to 80 to ride a bike.” But, of course, nobody would allow a small child to ride on the current configuration; the green paint doesn’t change the fact that cyclists are wedged dangerously between parked cars and fast-moving traffic. Nor does it change the fact that the lanes are routinely blocked. 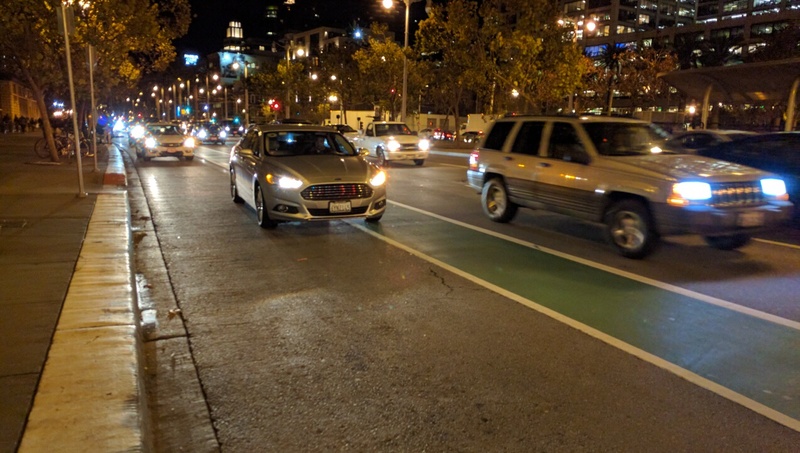 Which begs the question, why didn’t SFMTA apply the paint along the curbside in the first place, and put in safe-hit posts or planters, so that cyclists are protected from moving traffic? Yes, car lanes might have to be narrowed to permit a sufficient buffer (part of what they’re looking at now) but do we really have to wait years and do outreach meetings on every single corridor for such improvements? Can’t SFMTA build better templates for all streets and do away with this elongated, piecemeal approach, at least on streets that have high-injury rates? That said, better late than never–and anything that prevents the near constant conflicts between cars, cyclists, and pedestrians is welcome, especially on San Francisco’s iconic waterfront street.